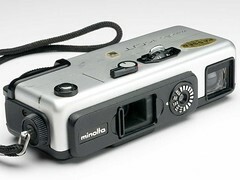 The Minolta 16 QT was the last camera made for Minolta's 16mm film cartridges. 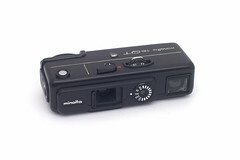 It features the same larger (12×17mm) frame size as the Minolta-16 MG-S, though it has a simpler 2 speed shutter and three element triplet lens. On the plus side, the lens focuses from 1.2m to infinity, whereas previous Minolta 16mm cameras are fixed focus. The exposure meter utilizes an alkaline battery. 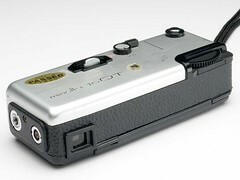 The QT accepts the same close-up, filter, flash and viewing accessories as the MG-S. The camera was offered in both chrome and black versions. Shutter: Speeds 1/30 and 1/250 sec.